The socialite is looking for her beautiful, aimless daughter, Angelina, who is about to become a very wealthy young woman. But as Christo digs deeper, he discovers there’s much more to the lovely “Angel” than meets the eye. Her father, her best friend, her boy­friends all have agendas of their own. Angel, he soon realizes, may be in grave danger . . . and if Christo gets too close, he just might get caught in the crossfire. 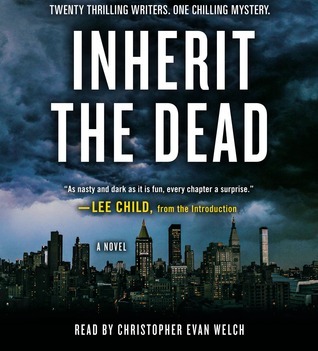 Inherit the Dead is a joint effort involving twenty popular crime fiction writers, each penning a chapter in a twisted noir tale in their own unique style. This is not an anthology; it’s a complete novel. The impetus for the collaboration was to draw attention to, and raise funds for, Safe Horizon, a victim assistance organization. This was a fun book to listen to. Each chapter began with a byline letting the reader know who the author was. While the story was not complex and got a little predictable at times, I was amazed at how well it flowed considering the number of authors involved. Occasionally there was a little repetition but that was to be expected. There were plenty of plot twists to keep me interested and a satisfying ending. All in all it was a fun ride through a classic noir tale. Dude’s one drink away from a liver transplant. He could read her body language as easily as the morning headlines. Made me think I was channeling Dashiell Hammett! I listened to the audio which was performed by Christopher Evan Welch, a first time narrator for me. He did a fine job conveying noir atmosphere and was easy to listen to. Fans of the genre are sure to enjoy this book. Sounds like an interesting experiment…and for a good cause..that’s always worth it. Very intrigued by this concept, and the story sounds riveting! I tried the Carl Hiaasen one years ago (Naked CAme the Manatee) but I don’t think the results were as good. I’ll have to take a listen to this one.